Sarah Dudas doesn't mind shucking an oyster or a clam in the name of science. But sit down with her and a plate of oysters on the half-shell or a bucket of steamed Manila clams, and she'll probably point out a bivalve's gonads or remark on its fertility. "These are comments I make at dinner parties," she said. "I've spent too much time doing dissections. I've done too many spawnings." "So when you eat clams and oysters, you're eating plastics as well," Dudas says. Funded by the Canadian government and British Columbia's shellfish trade association, the project aimed to learn whether the shellfish aquaculture industry may be contaminating its own crop by using plastic infrastructure like nets, buoys and ropes. The experiment was a response to those claims by local environmental groups. "We've long known that plastic and debris can be a problem for ocean life," says Ross, director of the Vancouver Aquarium's Ocean Pollution Research Program. "So, large numbers," Ross says. "Rather shocking numbers." They found plastics that were made small, like the polystyrene beads sold as bean bag filler and fake snow, and nurdles, the hard resin pellets used as a raw material for other plastic products. Microbeads, common in toothpaste and face wash, were also present. But the majority of microplastics in Ross' samples resembled those showing up in Dudas' shellfish. They're showing up by the thousands along Puget Sound's shorelines, too. They're microfibers. "It's overwhelmingly fibers," Ross says. "And they're being readily consumed at the bottom of the food chain, in zooplankton." The research is adding to the evidence of a problem that touches every corner of the planet: from the depths of the ocean abyss to the surface waters of the Arctic to an area in the middle of the Pacific Ocean now known as the Great Pacific Garbage Patch. Scientists think plastic pollution in the ocean could outweigh the fish there by 2050. 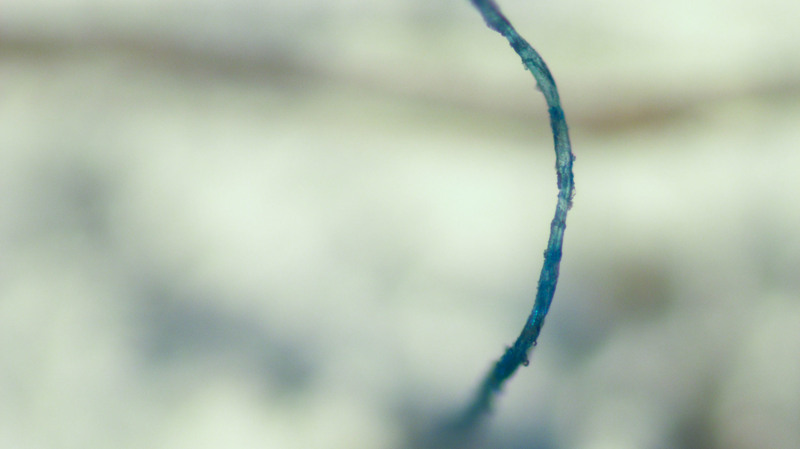 Ross believes that locating the source of microfibers will help slow that trend. So lately, his science lab is looking more like a crime lab. The detective work begins under a microscope. Researchers study a petri dish that looks like an I Spy book — a white background strewn with small colorful items. They note each particle's size, shape and color and zoom in to study its appearance: the way a fiber drapes across the dish or frays at its tip. If particles pass the eye test, they advance to a machine called the Fourier-transform infrared spectroscopy. "This is a fancy forensic machine used at police stations," Ross says. The machine scans individual particles with infrared light and generates a line graph on a nearby computer. Then the program cross-references that graph with a global database of other squiggly lines. One piece of fabric pulls up a list of probable matches — fibers with names like Zeftron 500 and Wonder Thread. They're types of nylon. Other fibers bring up generic and commercial names for olefin and polyester. The data can't pinpoint a fiber's exact source, but taken in aggregate can point to larger trends about the presence of microplastic pollution in the ocean. In many cases, the research is underlining the fact that many of the fibers ending up in the ocean are starting their journey much closer to home — probably in your home laundry machine. Outdoor gear manufacturer Patagonia found that the average synthetic jacket releases 1.7 grams of microfibers per load of laundry. Each load may generate hundreds of thousands of fibers, which can slip through filters on washing machines and wastewater treatment plants and eventually make their way into ocean waters. "The fabrics are degrading over time and getting flushed out into the water system," says Jeff Crook, chief product officer at Mountain Equipment Co-op, one of Canada's biggest outdoor retailers. The Vancouver-based co-op paid $50,000 to support Ross' effort. Improved filters may be one way to stop ocean-bound microfibers, Crook says, but he's looking to Ross' data for other information, like whether some types of fibers are ending up in the ocean more than others. The data could help start a conversation about creating industry-wide standards around fiber shedding, he says. "The more information we have, the more we can go back and tinker and improve the materials," Crook says. Others note that the world consumes hundreds of millions of tons of plastic annually — like food packaging and straws. 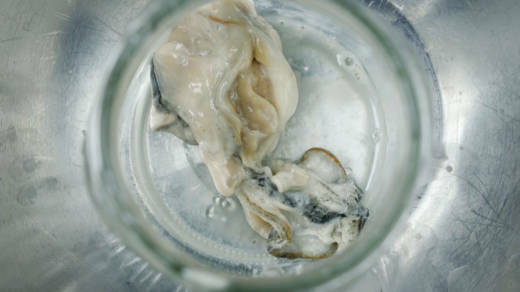 Dudas said that, while she is finding that farmed shellfish don't contain any more plastic than nonfarmed shellfish, she has no doubt that nets and ropes from shellfish aquaculture sites also shed fibers into the ocean. "My fear is that we have a latent reservoir of these products that could become our future supply of microplastics," Ross says. "And they'll in turn be ingested by zooplankton and move up into the food chain." Should we be concerned that we're part of that food chain? That research is ongoing, Dudas says, but the answer likely will depend on how much we consume. 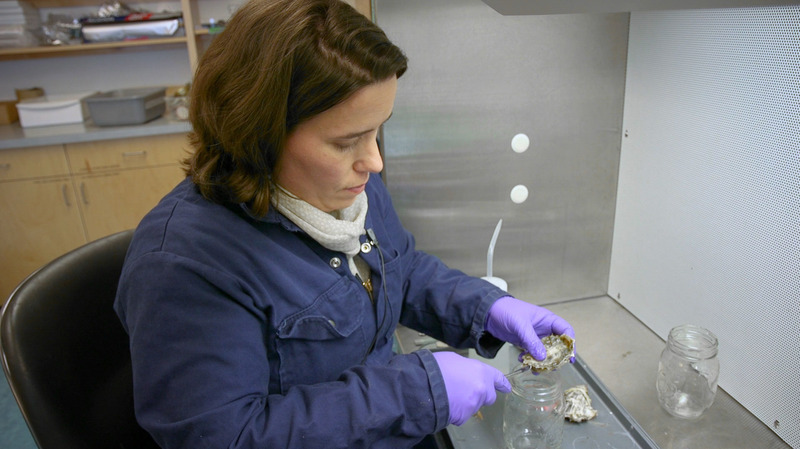 The clams and oysters in Dudas' study contained an average of eight microplastic particles each, preliminary results show. There are some indications that those plastics can act as vectors for chemical pollutants and pathogens, and other researchers are studying whether plastics leave the human body after being eaten. When in doubt, ask a shellfish biologist. "I wouldn't be overly concerned about eating shellfish specifically," Dudas said. "Microplastics are everywhere." This story comes to us from KCTS9 and EarthFix, an environmental journalism collaboration led by Oregon Public Broadcasting in partnership with five other public media stations in Oregon, Washington and Idaho.